The Wandering Palate Australian Correspondent, Andrew (Jenks) Jenkins, an indubitable ‘wandering palate’, goes on a Middle Eastern gastronomic peregrination and finds himself in Malta or least immersed in Maltese culture and the Mediterranean inspired Middle Eastern cuisine of Shane Delia at Maha, Melbourne. My wife’s family has developed a sensible protocol for Xmas, which involves each adult member buying one present, for a nominated other. That way you end up with one present you are more likely to enjoy than if you received half a dozen or so that you won’t. When Melissa’s sister Joanne, asked what I’d like for Xmas, I replied, strategically, “something Melissa would like”. 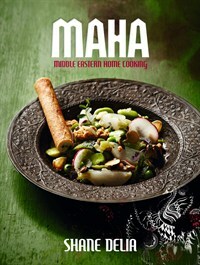 On Xmas day I unwrapped Shane Delia’s “Maha – Middle Eastern Home Cooking”. I’d been to Maha (the restaurant) twice before, but hadn’t talked to Joanne about the experience. Joanne by the way is a very good cook, and knows a thing or two about how restaurant kitchens work. The book is a terrific read, not only for the recipes and the use of the herbs, spices and infusions of the Middle East, but also for Shane Delia’s narrative throughout, which celebrates his Maltese family and culture, the influence of his wife, Maha and her Lebanese family and his culinary journey which includes training in French cuisine. This account also celebrates the importance in family life of the preparation at home, and shared enjoyment of food. There are basic recipes for ras el hanout and fel fel, preserved lemons, toum paste, vanilla and orange blossom dressing and much more; recipes which use Aleppo pepper, Argan oil, lemon sea salt, orange blossom water and pomegranate molasses; and the recipes are introduced with Shane Delia’s accounts of their origin and place in his family and his culinary journey. From Meze, or small tastes such as Olives with Uncle Joe’s Fel Fel, Hummus and Baba Ganoush (of course), Aunty Carmen’s Potato and Tuna Purpetti, to Sahen Zghir (small plates) and Sahen Kbeer (large plates) there is ample stuff for experimentation with Middle Eastern cuisine. I’ve left out the Mouabalet (side plates) and the Halwayet (sweets). From the latter, I have to try Tastes of Nannu’s Imbuljuta – Chocolate and Orange fondant, with Chestnut Ice-cream and Clove Foam. Read the book, it’s more than just a collection of enticing recipes. All of this prompted my third visit to Maha, last week, in the company of my mentor in Maltese matters, Phil Catania who has had the benefit of Maltese parents and upbringing, and who introduced me to the place originally. To impress me with his knowledge about Maltese matters he informs me that Malta is a very small, densely populated Mediterranean island, where the national sport is hop, step, splash. Good company, an important ingredient in any meal. Maha is housed in a basement down one of Melbourne’s many short lanes and streets. The atmosphere on entry is redolent of the house spice, ras el hanout, from the dark timbers and subdued but absolutely adequate lighting, to the Middle Eastern theme of rich Persian carpet, the odd Shisha on show. Inviting and warm, with very capable and enthusiastic staff. White Bean and Argan oil dip. Pumpkin Pilaki with Mustard Seeds. Baby Cucumbers with Pine Nut Vinaigrette. Olives in Maltese Fel Fel. Organic Bannockburn Chicken, cumin salt and Walnut Tarator foam. Cured tuna, fresh fig, preserved lemon, candied olive and goat’s curd. 12 hour slow roast lamb, olive pistachio tabouleh. Monk fish, pearl barley puree, sesame soil, tomato sumac dressing. Rice pilaf, tomato, pine nuts and dill. Maha doughnuts, olive oil Baklava mousse. Walnut parfait, cinnamon soil, Pumpkin Ice cream. Maha choc top, with blood plum yoghurt ice cream. This was lunch, but such was the size of the portions, and their balance and progress through a range of flavours and nuances, it was neither more nor less than sufficient, and Phil and I were able to walk back to our afternoon duties without discomfort. The overall impression is of warmth, balance, subtlety and complexity. The use of Argan oil in the white bean dip, for example, contributed a nutty, truffly nuance and complexity. The chilli in the olive dish arrived as subtle spikes amid the warmth of the large green and black and small field olives. The 12 hour slow roasted lamb was so fall-apart-tender, subtly suffused with sumac and cumin (the recipe is at page 104 of the book). And the sweet dishes were of the more please variety, a thorough delight. There is an extensive wine list here, with a wide selection of wines by the glass. My only regret, in retrospect is that while we drank well, I should have taken the option which is offered with the Soufra, to have wines by the glass selected by the restaurant staff to accompany each of the four courses. Speaking of the wine list, there are several vintages of Chateau Musar, a wine I haven’t seen since vintages of the mid 1970s. It lists wines, spirits and beers from Lebanon, Israel, Turkey, Morocco, along with the usual suspects. The Wandering Palate hasn’t been here, but I have. Three times now and I’ll be back. Each visit has been a delightful adventure in an Aladdin’s cave of new tastes. It must be one of the few eating places in Christendom that he hasn’t been to. I’m recommending a visit. Saha! Maha Bar and Grill is at 21 Bond Street, Melbourne, and its website at www.mahabg.com.au is up to date and informative.